Make this Valentine’s Day one to remember by gifting your loved one a bottle of Veuve Clicquot Rosé enclosed in a beautiful Couture Collection presentation box or the new Veuve Clicquot Rosé Shakkei. 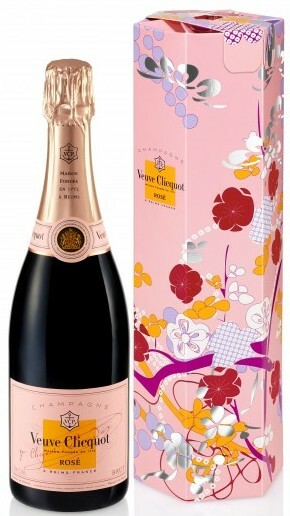 The ideal gift for any style lover, Veuve Clicquot’s Rosé Couture Collection is tailor made and fashion ready. Stitching together the link between haute couture and the luxury of the ‘So Clicquot’ lifestyle, this tailor made packaging dresses a single bottle of rosé Champagne in a silhouette befitting the contents. Unfolding like the pleats of a dress, the chic gift box twists open to reveal the creation inside. Keeping the bottle cool for up to two hours, this hand stitched design provides an elegant addition to your Valentine’s celebrations. Couture has never been so effervescent! The all new Veuve Clicquot Rosé Shakkei collection is inspired by the beautiful design of a Japanese garden – delicate rose blossoms, the iconic Japanese flowers of springtime, the longevity of bamboo, the luxury of hanaguruma and the violet of Champagne grapes. Swirled in yellow and rosé, the house colours, each design element of Veuve Clicquot Rosé Shakkei is deliberately chosen, symbolic and harmonious, in pure Shakkei fashion. Radiant on the eye, Veuve Clicquot Rosé has a shimmering and dazzling pink sparkle and is surprisingly intense on the palate. Veuve Clicquot Rosé boasts notes of raspberry, wild strawberry and cherry, with a touch of dried fruits and pastry – an ideal accompaniment to duck, shrimp or tuna, Veuve Clicquot Rosé is a perfect partner for a romantic meal for two. The perfect way to add a touch of glamour to Valentine’s Day celebrations, Veuve Clicquot Rosé is an elegant champagne that features a luminous colour with an attractive pink sparkle. Veuve Clicquot Rosé Shakkei and Veuve Clicquot Rosé giftbox are both priced at €70.59 and are both available from all leading off licences nationwide.